Wood restoration services from Refinishers in Golden, Colorado, means you never have to worry about your furniture again. Our antique repair and in-home refinishing treatments will bring the shine back to your pieces without compromising their character. 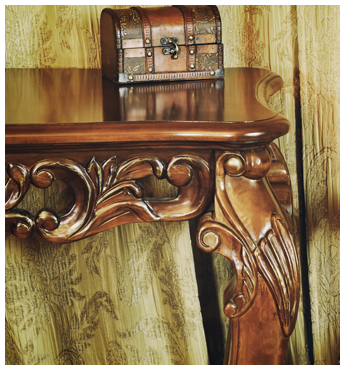 Bring life back to your fine antiques with our refinishing and restoring services. Our fourth-generation master craftsmen use time-tested, color matching techniques to provide you with a finished piece that will satisfy even the pickiest collector. We designed a unique "Recycle Strip System," where we quickly remove old finishes with a flow brush. This system avoids wood saturation and is the affordable alternative to expensive hand-strip methods. We use the least amount of chemicals possible, so as not to loosen joints or lift veneers. If you want to customize your piece on your own, ask us about our Strip Only service. We strip your furniture of old finishes and prepare it for your handiwork. Our craftspeople prepare your furniture in a clean and fully equipped workshop. Color experts mix color to match tone, sheen, and texture to the shade that you prefer. In fact, we offer a color chart so that you can choose the exact shade you desire. We also offer a variety of finishes, with the most popular being lacquers, Danish and tung oils, faux, whitewashed pastels, and southwestern shadings. Our skilled workers will re-glue, recreate missing pieces, and repair shattered legs to make your furniture and antiques look like new while retaining their vintage charm. Using effective techniques, we make scratches and dents virtually disappear. Consult with our staff if you're unsure of how to restore your piece. We offer several options to correct even the most difficult repair problems. Refinishers has worked with companies in a variety of industries. Please see our references for more information.